God’s ability | Why Did You Do That God? Do you see yourself as a philosopher yet? This might sound like a strange question, but it really isn’t. The reality is that we are all philosophers. It is in our DNA from the time of Adam. Whereas the animal kingdom is governed largely by instinct, we have been designed by our Creator to be in His image and likeness. We are creatures of reason and logic with a precondition to learn new and different things. We have a God-given mind that requires feeding. We can feed it with bad input, good input or the best input. What feeds our mind determines how we view life and respond to it. That becomes our philosophy for living. We all will choose between two opposing philosophical narratives. That decision will define our fellowship with God. An earthly, or human wisdom and a divine wisdom as declared clearly in 1 Corinthians 1:18 through 2:13. I encourage the reading of those scriptures to clarify this subject matter. Two definitions will help qualify the balance of this post. Philosophy – System, process of thought, wisdom. Philosopher – A person who lives and thinks according to a system of philosophy. As expressed in the above scriptures it is fair to say that human wisdom comes from the character of mankind and divine wisdom comes from the character of God. Character, by Webster’s Dictionary, is the complex of mental and ethical traits marking a person. Which of the two do you think is worth taking to your grave? Adam and Eve had to choose the “system” of wisdom that would govern their lives. 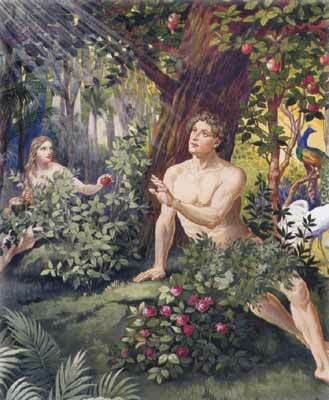 These opposing philosophies were offered by way of two trees planted in the middle of the Garden of Eden. Why were they placed there? God’s glory expressed in His eternal plan and purpose necessitated man’s free-will choice to obey God or self. The tree of life offered the choice of being governed by a divine philosophy from God and administered by the Holy Spirit. The tree of the knowledge of good and evil offered the choice of being governed by human philosophy from one’s own spirit man who died to the Spirit of God when the forbidden fruit was eaten. This decision required them to be dependent on a restricted philosophy that included the overwhelming influence of the lust of the flesh, the lust of the eyes and the pride of life; see 1 John 2:16. Adam and Eve were in God’s grace at the moment of creation and through a cloaked temptation they choose to disobey a direct command given to Adam by God. God’s grace departed them leaving them to their own ability. We have not escaped the predicament of making that same choice in our own life. We can accept the gracious offer from God to receive divine wisdom, through the sacrifice of Jesus Christ, to govern our decisions, or we can certainly hang onto the wisdom we now have. That wisdom does not satisfy in the long-term and ends in the Lake of Fire through the choice we made! We, being originally outside God’s wonderful grace, due to our own sin, are wooed by the Spirit of Grace to come under that precious gift. By free-will choice to accept the Person of Jesus Christ, crucified and resurrected, we are saved by grace through faith. Please note: Grace means “unmerited favor,” “receiving what we don’t deserve” AND depicts God’s ability working on our behalf!